the beam and column longitudinal bars framing the joint core. Equation (D5.21) above giving the design shear force in the joint presumes that bond strength along the beam top bars is sufficient for the transfer of this shear force. Although loss of bond along these bars will not have dramatic global consequences, it would be better avoided through verification of bond along the bars of the beam. This verification has the form of an upper limit of the diameter of the longitudinal bars of the beam, dbL, that pass through interior beam-column joints or are anchored at exterior ones. This upper limit is derived as follows. b 4 irdbLhco 4 hco with bond stresses along the length of the bars outside the confined core considered negligible. Plastic hinges are assumed to develop in the beam at both the left and right faces of the joint. As the top flange is normally much stronger than the bottom flange both in tension and in compression, its force cannot be balanced unless the bottom bars yield. So, in the bottom bars we have crs, = -/ and <rs r = /, and rb is equal to dbLfyl2hco. Regarding the top bars, it is assumed that at beam plastic hinging they yield at the face at which they are in tension: as ,=/ . At the right face of the joint their compressive stress, as r, is such that, together with the force of the concrete in the top flange, Fc r (negative, as compressive), it balances the tension force in the bottom bars. These latter bars have a cross-sectional area As r2, and at plastic hinging they are forced by the stronger top flange to yield, so that cr. where />, and p2 are the ratios of top and bottom reinforcement at the right face normalized to the product bd of the beam, u is defined as lo = p jy/fc and £rff is the depth of a fictitious compression zone, normalized to d, such that Fc r = -bd£eiifc. Therefore, at the top bars Tb is equal to and its value is lower than along the bottom bars for the same value of dhL. However, the bond problem seems to be more acute along the top bars, because bond stresses are not uniformly distributed around the perimeter of the bar but are concentrated more on the side facing the joint core. At the top bars this is the underside of the bar, where bond conditions are considered 'poor' due to the effects of laitance and consolidation of concrete during compaction. At the bottom bars bond conditions are considered 'good'. the seismic design situation; although no special instructions are given in Eurocode 8 for tensile net axial forces (as may occur in exterior columns of medium- or high-rise buildings), it is clear from the way equations (D5.28) are derived that in that case = 0. It is most convenient to apply equations (D5.28) at the stage of initial sizing of columns, on the basis of the desired maximum value of beam bar diameter. This can be done on the basis of a rough estimate of the minimum axial load ratio v6 in the seismic design situation (corresponding to only the gravity loads in interior columns and gravity minus axial forces due to the overturning moment in exterior ones). At that stage the final value of the top reinforcement ratio p1 in equation (D5.27) will not be known, so in equation (D5.28a) the value of px in equation (D5.27) was taken equal to the maximum value allowed, px max, from equation (D5.24). At the same stage the bottom steel ratio p2 may be taken to be equal to the minimum value from equation (D5.22), or to 0.5p! max. These convenient choices for p2 and Pi, max are unconservative for db] . This should be viewed, though, bearing in mind that equation (D5.28a) is very demanding for the size of interior columns: a column size hc of over 40dbh is required for DCH, common values of axial load (vA ~ 0.2), steel with nominal yield stress of 500 MPa and relatively low concrete grade (C20/25) - i.e. hc over 0.6 m if dbL =14 mm and over 0.8 m when dbL = 20 mm. The requirement is relaxed to about 30dbh for medium-high axial loads and higher concrete grades. If DCM is chosen, the required column size is reduced by about 25%. Although onerous, such requirements are justified by tests: cyclic tests65 on interior joints show that the cyclic behaviour of beam-column subassemblages with hc = 18.75dbL is governed by bond slip of the beam bars within the joint and is characterized by low-energy dissipation and rapid stiffness degradation; a column size of hc = 31.5dbh was needed for the cyclic behaviour of the subassemblage to be governed by flexure in the beam and to exhibit stable hysteresis loops with high energy dissipation (subassemblages with hc = 28dbL gave intermediate results). According to Kitayama et al.,66 the energy dissipated by subassemblages with hc - 20dbL cycled to a storey drift ratio of 2% corresponds to an effective global damping ratio of only 8%. Although equation (D5.28a) has been derived for the top bars, according to Eurocode 8 it applies to the bottom bars of the beam as well. For the bottom bars the denominator in the second term of equation (D5.28a) should be replaced by 2, and term 7.5/ctm in the numerator should be divided by 0.7, to account for the 'good' bond conditions. The end result is about the same as that from equation (D5.28a), so for simplicity the same expression is used for bottom bars as well. It should be noted, though, that for the bottom bars of exterior joints, equation (D5.28b) is conservative by a factor of about 0.7 for the required column depth hc due to 'good' bond conditions. 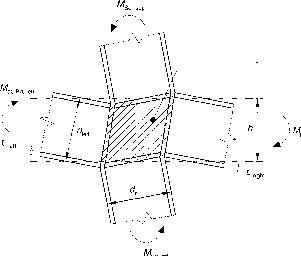 5 proposes the anchorage arrangements in Fig. 5.7 as an alternative to increasing the column size or reducing the diameter of beam bars in exterior beam-column joints to meet equation (D5.28b). Equations (D5.28) lead to the use of square columns in two-way frames. Moreover, unless column sizes are large for other design reasons (drift control, strong column-weak beam design to satisfy equation (D4.23), etc. ), equations (D5.28) lead also to small diameters of beam bars. To prevent them from buckling, such bars need to be restrained by closely spaced stirrups, especially at the bottom of the beam which lacks the lateral restraint provided at the top by the slab.